The project started with a proposal in November of 2009, when Cary was manually reading over 57,000 meters per month in Cary and Morrisville. (Yes, Cary is the water utility provider to Morrisville.) That meant that trucks were rolling – and a number field personnel working for the Town were driving to your neighborhood and walking to read your water meter. – along with reduced headcount (10 people), and reduced worker’s compensation by reducing job-related injuries. However, the finance department has found that THAT number was conservative. A recent cost analysis shows that we will save close to $10.2 million dollars, which is great news for our utility ratepayers! There are also other huge benefits besides the cost savings. With this system, we can find a leak when it’s much smaller – so that it can be repaired more proactively, and sometimes, finding leaks earlier means a cheaper repair. And, of course, conservation is another key benefit. By giving our citizens actionable information about their water usage, the hope is that it gives us EACH the power to see what we are using, and potentially make changes to reduce our water usage. Each meter will send water usage information to a regional collector 4 times a day. The collector will forward that information to Town Hall. 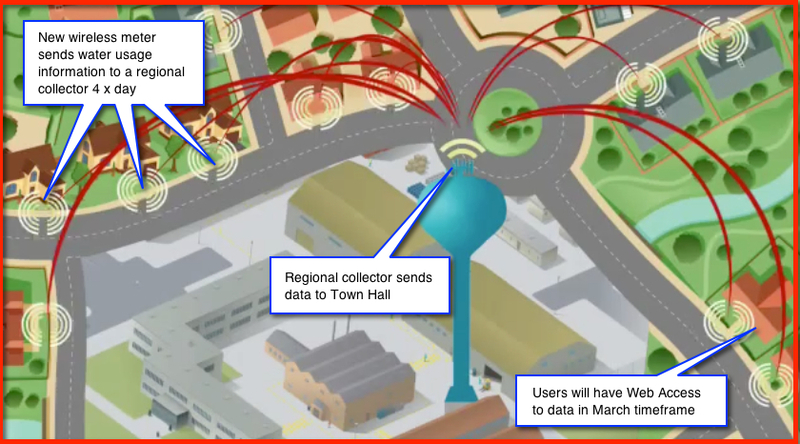 With this capability, the Utility services will have more than 500 million data points per year. This will help narrow down any problems in the system, and also for them to notice any trends that may help improve efficiencies. The members of the Information Services Advisory Board and members of the Technology Task Force got a sneak peak into the tool recently. They all gave valuable feedback, and a number of changes have been made based on that feedback. New enhancements to the tool are also coming, so make sure to give you comments, as well. What can you learn from all this data? For instance, look at this data below. What can you see? Something very interesting. Look at the “Hourly Water Usage” section line chart. Notice that on December 29th, from 3am to 7am, the water usage does not ever go to ZERO. It just hovers at a few gallons an hour. That’s because there was a leaking toilet in the house. This is a small example – but just think of it. That’s not only wasted water, but you are not only paying for the water, you are paying for the sewer associated with that. I also heard several stories from staff and homeowners, where Town Staff were able to proactively contact a citizen to let them know that they had a leak. In one case, letting them know helped them identify that their water heater was leaking (sometimes that’s the first step before you water heater dies), and in another case, actually SEEING the system was leaking, and proactively turning off the water before significant damage was done to their house. It’s possible to use less – and many folks do. I have friends, who will remain nameless, who tend NOT to flush their toilet during the day. 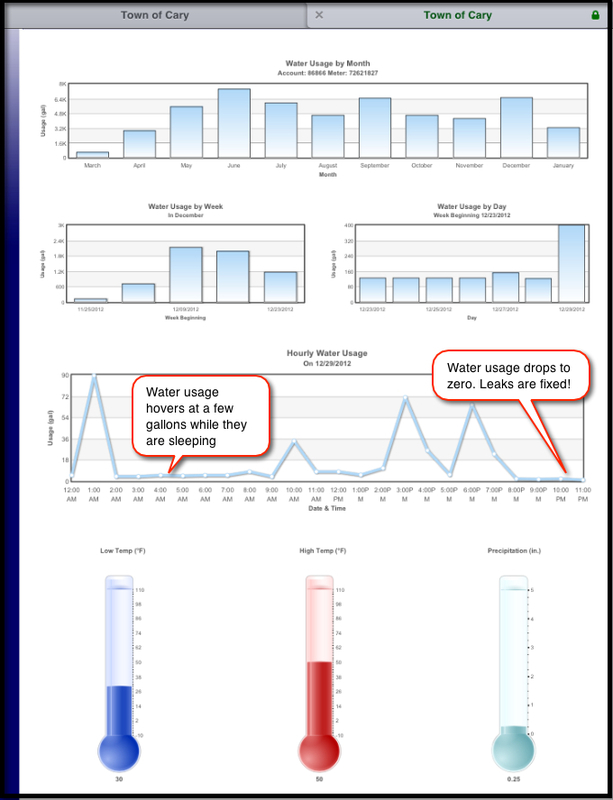 You can even set up alerts in the system for it to proactively alert you on water usage. There’s a good reason for doing that. 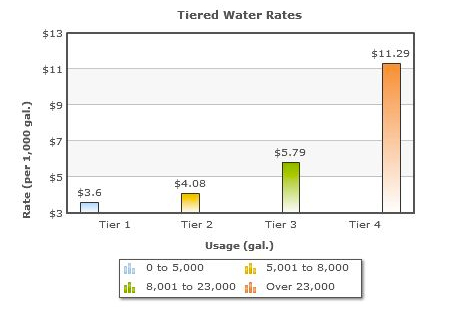 In Cary, we used a tiered rate structure for our water usage. So, at a particular threshold, any water used over that “line” becomes more expensive. Using just 1,000 gallons? You are charged $3.60. Using 6,000 gallons? You are charged $3.6 for the first 5,000 gallons, and $4.08 for the last 1,000 gallons…. And so on. You might want to be alerted when you jump over a threshold. Or, maybe you want an alert when you exceed a particular number of gallons in a single day? That’s possible too. All of this gives you more power – more power to know your usage, on a daily basis rather than waiting for your monthly bill, when it’s really to late to make any changes to affect your bottom line. Hopefully you will find that this new system is a step in the right direction for Cary. Yes, there are still opportunities to enhance our system. (For instance, I can’t WAIT to NOT get a paper bill. ☺) And the usability and graphics will improve over time. But the power to see WHAT you use, close to WHEN you use it, is great. 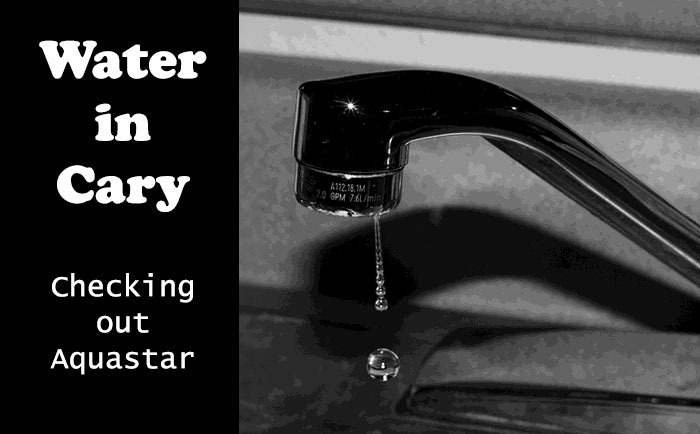 I’m looking forward to the new capability as a way to help in my own water conservation efforts. Thanks for listening! And always feel free to contact me if you have questions, comments or concerns.